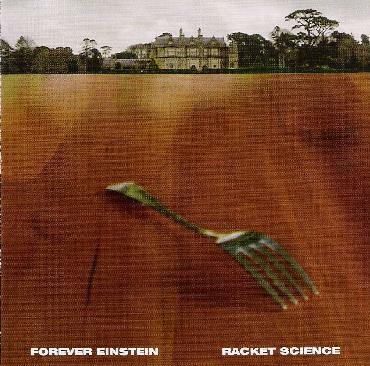 Forever Einstein - "Racket Science"
Forever Einstein are a guitar/bass/drums trio from Connecticut who play a fun and whimsical brand of instrumental avant-rock. The band consists of Charles O'Meara on guitar, Kevin Gerety on bass and John Roulat on drums. O'Meara is leader and composer, and some readers may know him under his other recording name, C.W. Vrtacek, as well as his role as a member of Biota. Describing Forever Einstein is difficult because they cover quite a bit of territory. They are, on the one hand, firmly in the avant-progressive rock realm. However, for challenging and adventurous music this is highly accessible. The band demonstrate a range of stylistic influences, all the while communicating a sense of bouncy good humor and light hearted fun. One of my favorite tracks alternates between a kind of prog carnival soundtrack and early 70's classic progressive influences. We've got everything from Zappa, to avant-prog á la Henry Cow, 60's beach party film soundtrack moods, ambient jazz, Blues, and a bit of psychedelia. But nothing about Forever Einstein really sounds like any of these. They just excel at synthesizing various styles and influences into something very much their own. They're far from mainstream, but not too out there. Just really enjoyable well played instrumental avant-rock. Forever Einstein also have some of wildest track titles I've ever seen, though they're so damn long I'll have to be forgiven for not referring to specific ones. But suffice it to say that with titles like "It's a good thing I don't have super brain powers or you'd be in a thousand little pieces right now" that this is a band that plays really cool rock music while probably not taking themselves too awful seriously. Racket Science is the bands fifth album for Cuneiform but the first I've heard. I'll be interested in checking out their earlier releases. For more information you can visit the Forever Einstein web site at: http://www.forevereinstein.com. Visit the Cuneiform Records web site at: http://www.cuneiformrecords.com.